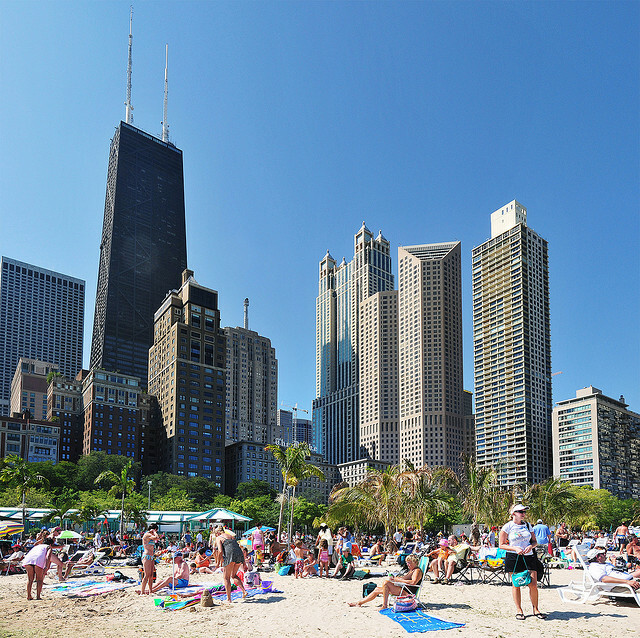 Hancock Center towers over Chicago’s incomparable Oak Street Beach on the city’s Near North Side. For three summers, I was a member of Building Services Employees International Union, Local 109. I then was working for the Chicago Park District picking up trash, cutting back underbrush, trimming trees, and raking up dead alewives – in countless numbers — that washed ashore at the Hyde Park beaches around Promontory Point. I loved Lake Michigan before then and even more after. Growing up in Chicago, I thought it was as big as an ocean. The reasons was simple: I couldn’t see the other side I reminded my parents when I was a kid. Rich Cohen’s travel piece in today’s New York Times is a wonderful hymn to those memories – the stately Drake Hotel, magnificent Oak Street Beach, the awesome Indiana Dunes, beautiful Traverse City, timeless Mackinac, and Milwaukee’s wonderful art museum and its dowager grand hotel Pfister. Enjoy the best of the Third Coast. next post: Image of a Vet: Hero, Victim, Something Else?